Weight: .4 oz. (11.3 g.) / 2.2 oz. (62 g.) ttl pkg. 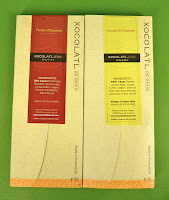 Today's first bar, of two, from Xocolatl de David (Portland, OR) contained espelette pepper and a hint of Fleur de sel. I broke off a small shard from this relatively thin bar -- that was just the right thickness for tasting. I haven't found espelette peppers to be very flavorful when mixed with chocolate. The dark chocolate (74% cacao from Dominican Republic) may have overpowered this more mild member of the "pepper" group. 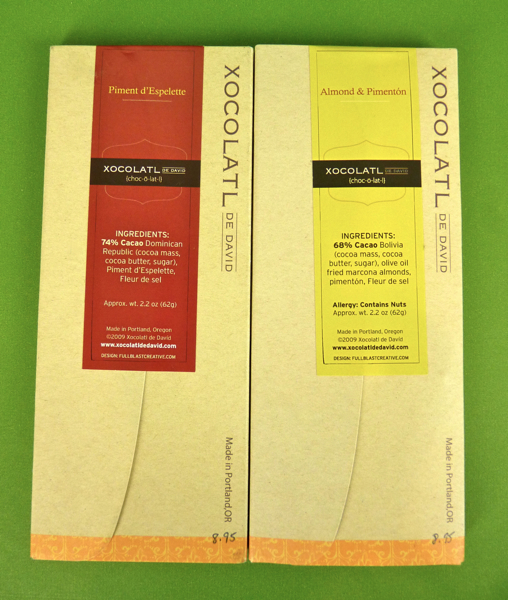 I did find the company's second Almond and Pimenton bar (made with 68% cacao from Bolivia) to be more flavorful. The olive oil fried marcona almonds with pepper and Fleur de sel were hard to beat. Not terribly spicy, but very tasty. Today was Day #7 of Chocolate and Pepper Theme Week, and Day #2 of Chocolate and Salt Theme Week.